For a simple, five-letter word, “detox” certainly conveys a broad range of meanings depending on the context and the audience. Making matters worse, many marketers of supposed “detox” products have compounded the confusion by using the term loosely in connection with “colon cleanses”, “juice cleanses” and “detox diets”. 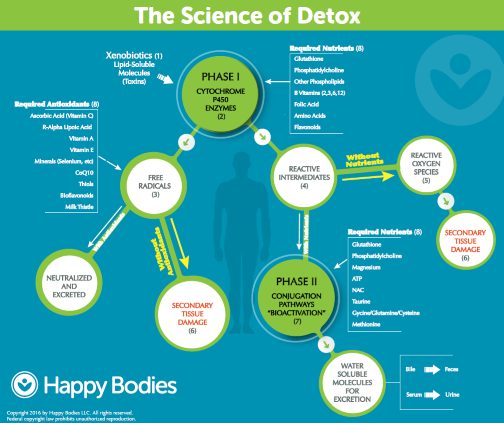 From a scientific standpoint, detoxification refers to the natural biochemical processes and systems by which the human body eliminates toxins and waste from cells. It does not refer to chemical laxatives that simply remove waste and nutrients from the intestines and colon, starvation “cleanses” that deprive the body of solid food and essential nutrients, or supposed miracle cures that claim to offset the effects of alcohol, drugs and an unhealthy diet. The science of detox is about the science of liver nutrition. The human body has an amazing ability to cleanse itself of not only wastes created by the biochemical processes within the body, but also toxins that originate from outside the body. These foreign toxins – also known as “xenobiotics” – can cause both near-term acute reactions and long-term chronic illnesses. The liver is the primary organ responsible for natural detoxification and, without proper nutrition, it cannot function efficiently. There is no escaping the fact that our bodies are assaulted by an array of xenobiotics on a daily basis – air and water pollution, pesticides, toxic chemicals, industrial waste, and prescription and over-the-counter drugs. As a result, our bodies are polluted. Here is one example -- according to the National Institute of Environmental Health Sciences, detectable levels of BPA, a chemical used in plastics that is characterized as an endocrine disruptor (mimics human hormones), were found in 93% of humans six years and older in a recent study. Making matters worse, modern Western diets further pollute our bodies with excessive fat, sugar and salt. All of these harmful substances are processed in the liver. There is growing evidence that this toxic onslaught is overwhelming our livers’ capacity to process and eliminate toxins efficiently. According to the American Liver Foundation, approximately 20-30% of adults and 3-10% of children have excessive fat in the liver. Known as non-alcoholic fatty liver disease, or NAFLD, this condition can lead to a serious liver disease called non-alcoholic steatohepatitis (NASH). In addition to NAFLD and NASH, liver cancers are on the rise. The American Cancer Society states that liver cancer incidence has tripled since 1980. Without question, liver disease has become an epidemic. Fortunately, there is extensive clinical research that suggests that targeted liver nutrition can safely support the healthy functioning of the body’s natural detoxification pathways. Phase 1 – Bioactivation: A number of specific liver enzymes trigger reactions that create a “reactive site” on the toxic molecule that will later bind the toxin to a water-soluble molecule in Phase II. Importantly, these activation reactions often generate radical oxygen species, or “free radicals”, that require antioxidants for neutralization. Phase II – Conjugation: Often times, the intermediates created in Phase I are even more reactive and toxic than the original toxic molecule. It is therefore critical that Phase I intermediates be rapidly transformed into water-soluble molecules. Phase II conjugation reactions achieve this objective by binding the reactive intermediate to a water-soluble entity such as sulfur or an amino acid. It is important to note that Phase II conjugation reactions require significant energy in the form of ATP, the main source of energy in human cells. Phase III – Transport: Phase III of the detoxification process involves the transport of the transformed toxin out of the cell for elimination via the kidneys or in bile. In order to function optimally, the liver’s detoxification pathways require targeted nutrient support. Keep in mind that detoxification is a daily process – it happens naturally every minute of every day. Your detoxification regime should therefore emphasize daily nutritional support rather than focus on periodic cleanses or intermittent fasting. Antioxidants – antioxidants, which donate free electrons to neutralize free radicals, are essential for dealing with the reactive intermediates created in Phase I. In the absence of antioxidants, free radicals can steal electrons from healthy cells causing what is known as secondary tissue damage. Glutathione, ascorbic acid (vitamin C), r-alpha lipoic acid, silymarin (milk thistle), vitamin A and vitamin E are all important antioxidants for liver health. Most important among them is glutathione, which is also known as the “master antioxidant” because it can recharge other spent antioxidants in addition to being a powerful antioxidant in its own right. Unfortunately, glutathione is depleted when toxins are detoxified and our glutathione levels decline with age. Happy Bodies® Detox Cocktail® is a convenient, pre-mixed powder that delivers therapeutic dosages of pharmaceutical-grade glutathione and other essential liver antioxidants at less than half the cost of mixing your own. Introduced in 2005, the original Detox Cocktail® is flavored with organic, natural lemon flavoring and is made with no fillers, preservatives, excipients, or artificial colors or flavors. It comes in either a 90-serving jar or a box of 30 convenient single-serve packets. 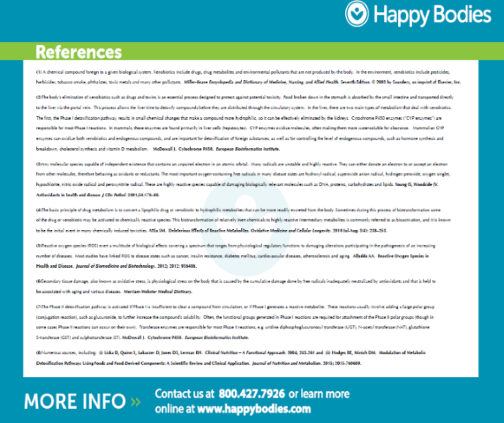 All Happy Bodies® products are manufactured in cGMP certified facilities. For those looking for a targeted glutathione supplement in a highly-bioavailable form, consider Happy Bodies® Detox Boost liposomal glutathione. Detox Boost is readily absorbed and utilized thanks to a patent-pending Etheric DeliveryTM Phospholipid Encapsulation System. The glutathione molecules are encapsulated in nanospheres of sunflower-derived phospholipids, which protect the glutathione from digestive enzymes. This delivery format has been shown in cell cultures to be significantly more efficient for intracellular delivery than intravenous-based glutathione. The patent-pending process, plus our natural lemon flavoring, allows this product to be taken intra-orally without the foul sulfur taste typical of other liposomal glutathione products. Phospholipids – efficient biotransformation requires healthy cell membranes that allow for the passage of fat-soluble toxins into the cell and water-soluble wastes out of the cell. Phosphatidylcholine, an essential phospholipid that is a significant building block of every cellular membrane in your body and a major constituent of bile, is an important element of any natural detoxification regimen. Because it is amphiphilic (simultaneously water-attracting and water-repelling), phosphatidylcholine facilitates the efficient flow of molecules through the detox pathways. Happy Bodies® HB-PC 40% phosphatidylcholine powder is more potent than regular lecithin and supports daily detoxification. HB-PC is also certified GMO-free and can be mixed into your daily Detox Cocktail® for added convenience. Magnesium – magnesium is required by the human body for both glutathione synthesis and ATP metabolism. Given the importance of glutathione to the healthy functioning of the detoxification pathways and the significant demand for ATP-derived energy in Phase II, a highly-bioavailable and well-tolerated form of magnesium should be considered as a helpful addition to your detox program. Happy Bodies® offers a high-quality, GMO-free magnesium supplement, HB-MAG 100% pure magnesium citrate powder. HB-MAG dissolves easily in water and contains no dairy, wheat, yeast, soy, corn, animal products, fillers, binders, preservatives or nightshades. It is also gluten-free and vegan. Pollution is everywhere around us and, unfortunately, inside us as well. While avoiding toxins and poor dietary choices is our first line of defense against toxic burden, optimizing your body’s ability to biotransform toxins and safely excrete them is critical in maintaining your overall health. Your liver is the most important component of your natural detoxification pathways and it requires targeted, daily nutrition to function properly. Forget the cleansing and fasting fads and focus instead on the science of detox. Love your liver today with high-quality nutritional supplements that support natural, daily detoxification. Founded in 2005, Happy Bodies® is an evidence-based dietary supplement brand that focuses intensively on the effects of environmental toxins on liver and overall health. We believe that the human body has a miraculous ability to cleanse itself. We also recognize, however, that the world around us is increasingly polluted and that the modern Western diet further pollutes the human body with high levels of fat, sugar, salt and alcohol. Excessive toxic burden can overwhelm the body’s natural detoxification pathways that reside predominantly in the liver. Our mission is to provide you with products and information that safely support and promote your body’s natural detoxification system. While other marketers seek to capitalize on “detox diets”, “cleanses” and other fads, we believe that detoxification is about the science of liver nutrition. Our product portfolio is driven by what we refer to as the “Science of Detox”. All product formulations are supported by credible, third-party research and rely heavily on input from healthcare and nutrition professionals. Our products are manufactured exclusively in facilities that are cGMP-certified and we never use fillers, preservatives, binders, flow agents, or artificial colors or flavors. Everything we do follows our four core principles: Quality, Integrity, Safety and Science. – The Science of Detox.